On 13 June IBF celebrated its 10th anniversary in a live joint meeting of its 100 plus members between London and New York. The Digital Workplace Group’s CEO and Founder Paul Miller chooses the 10 intranets that, in his belief, have defined the intranet industry in the past 10 years. In 2008, Kellogg’s led the way in making their world-famous brands part of their intranet reality. The result was about as far away as you can get from a regular intranet with brand icons such as Tony the Tiger used to drive fun, brand-driven culture messages. Even in 2003, the IBM ‘people pages’ took your breath away. Facebook had not yet launched but the IBM intranet showed how a powerful people search could enable expert connections and that exhilarating sense of having knowledge at your fingertips. In 2006, the Unilever seamlessly combined their intranet with their Dove brand while also providing local information – magically you could also see the rest of Unilever all on the home page. The eternal global versus local balance dilemma beautifully navigated. 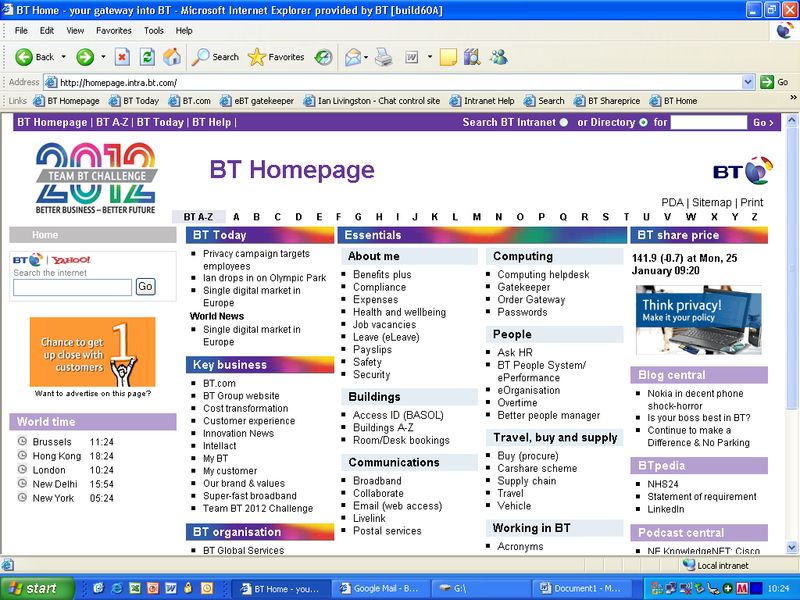 Back in 2004, the BBC’s intranet blended superb communication with real tasks that mattered, all on the home page. Using features such as expenses, staff finder and travel booking, the BBC’s pioneering intranet team created an experience that made productivity on the site into a compelling reality. In 2008 when the financial sector was still healthy and no one had mentioned “social intranets” (it was all web 2.0 then! ), this major global financial insurer re-invented their intranet. With open discussions, leadership dialogue and courageous challenges, the Aviva intranet defied regulation-driven taboos and made “social” their habit. Pick any year and BT is always up there. At the IBF, what we found refreshing was a home page that rejected news content outright. Instead we found a set of central links to information that people needed. BT said, “We have news, but we’re not news addicts.” BT trusted that the activities that saved time and enabled mobile working would ensure high performance in many annual benchmarks. Microsoft has always been central to intranets through its SharePoint products. However this did not prevent them from being independently benchmarked by the Digital Workplace Group (DWG) in 2011 and held in comparison against many of their own customers. Their intranet – much like everyone’s – had its ups and downs, but Microsoft showed that no matter how dominant you are in an industry, user experience is the real judge of success. Language has always challenged global intranet teams. In 2010, IKEA’s dynamic unit powered up our league tables thanks in part to their ability to make sites work in local languages. They respected their local staff and gave them what they needed. During the London bombings of July 2005, TFL had an intranet team ready to deploy essential information to its employees and other emergency personnel through its intranet. This experience was followed by a project to create the concept of an intranet site that can be deployed built for any such emergency in the future. This new intranet for emergencies set a standard for crisis-planning. Transport for London’s intranet, 2006. Electrolux has consistently innovated in the intranet field. Their latest intranet incorporated a new social media element explicitly able to be used through tablets (particularly iPads). This was one of the first to put tablets forward as a key intranet environment and with huge success. Has Paul overlooked one of your intranet’s great achievements? Send details together with a relevant screenshot from your intranet to admin@digitalworkplacegroup.com and we’ll publish the best. Paul has also posted 10 Lessons for Intranets from 10 years of IBF.